History records that rapacious, musket-armed Arab slave caravans of the 18th and 19th centuries avoided transiting what is now central and southern Kenya and northern Tanzania—it just wasn’t worth risking the wrath of the belligerent spear-wielding Maasai who dominated the region. Early European explorers as well dreaded the sight of a line of colorful leaf-shaped shields appearing on a hilltop, and took roundabout routes into the interior. 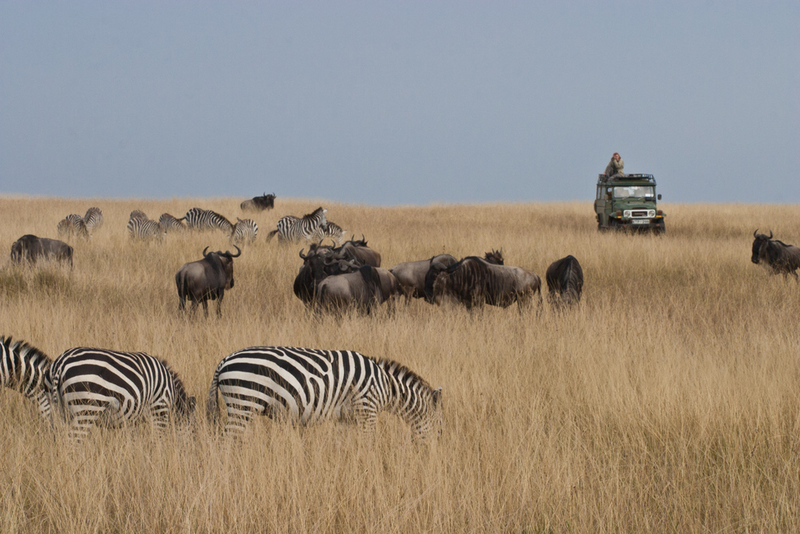 Even the mighty British Empire never directly confronted the Maasai militarily, and relied instead on political sleight of hand to squeeze the tribe out of its best grazing lands once the area was deemed a protectorate. While the Maasai no longer range and raid at will over the East African landscape, they have continued to fight to retain their identity as a tribe and culture, picking and choosing which bits of the modern world they wish to adapt. Thus a red-robed and sandaled herdsman leaning on a spear in the South Rift is quite likely to be chatting in Maa on a cell phone, and a smartly-dressed businessman in Nairobi might go home for the weekend to a hut surrounded by a thorn boma that keeps lions out of the livestock. But one icon of Maasai history—those tall, intricately decorated rawhide shields, so universally recognizable that one features centrally on Kenya’s national flag—seemed lost forever, save as dusty relics in museums, rare and expensive objets d’art from exclusive curio dealers, or, tragically, as cheap, undersized, shoddily made tourist souvenirs. The loss was doubly sad since each shield’s design elements, or sirata, revealed detailed information about its bearer’s clan and achievements, and thus represented a tangible record of Maasai history. 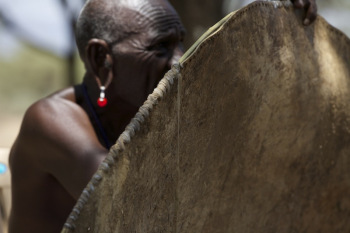 This loss seemed unacceptable to two elders in the Olkirimatian community of Kenya’s South Rift Valley. 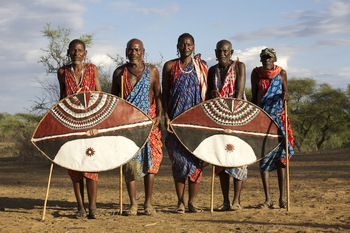 Tonkei Ole Rimpaine and Karinte Ole Manka—both former shield bearers now in their 70s—approached ConserVentures with a plan: They wanted to put together a workshop to build new shields, using authentic techniques and materials, with the immediate goal of producing examples to be displayed in a planned Maasai heritage museum, and the secondary but much more vital goal of passing on their knowledge to a younger generation. Through the generosity of several donors, we arranged to source rawhide and supply food and transportation to the group, and to use the Lale’enok Resource Center as a base. John Kamanga, the chairman of the Olkirimatian community and a driving force for Maasai cultural conservation, was our liason as we worked on logistics from 7,000 miles away. The construction team comprised John’s father, Ntetiyian Ole Pasoi, two other elders, Sipale Mpoe and Marikete Ole Ilelempu, and four women, Rijano Ene Ntetiyian (John’s mother), Majakus Ene Saitage, Moyiangei Ene Sampao, and Bebi Ene Mugesa. Over the course of five days in late October, Tonkei and Karinte supervised the group while we photographed and filmed the entire process. In that time, one cowhide (the only major concession to the 21st century, the original cape buffalo being no longer available since Kenya banned hunting), some goatskin, and a pile of limbs from a Cordia senensis tree magically morphed into two sturdy shields—a stiff rawhide face backed by a carved, tensioned center stay and handgrip, the perimeter laced with goatskin around flexible Cordia wands. Then, alchemist concoctions of charred bone, ocher, limestone, and cow’s blood (the latter amusingly stored in an old Famous Grouse whiskey bottle), dabbed and streaked on the shields with chewed twigs, blossomed into recreations of the original Olkirimatian sirata. The two senior elders eyed each line and color critically, and more than once sections were scraped off and re-painted to achieve the proper symmetry. Throughout the process, young Maasai men of the community hung around to watch or help, taking cell-phone photos and fueling our hopes that some might be inspired to take up the craft as a business—we believe there’d be a ready market for detailed and authentic Maasai shields as a counterpoint to the cheesy tourist rubbish. 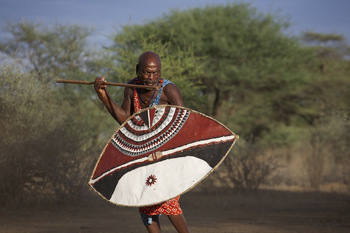 To us the end products—as far as we know the first true Maasai shields produced in decades—seemed like priceless artifacts. Yet before the paint was dry Tonkei and another elder had grabbed them and set to in a fierce mock duel, leaping and yelling like the Morani they were 50 years earlier while we cheered wincingly from the sidelines. The completed shields, not minus a few scuff marks, are now stored at the Lale’enok Resource Center. One will be taken to Nairobi to be used in educational programs; the other is destined for the planned cultural museum to be built at a nearby archaeological site, Olorgesailie. That is, as long as Tonkei Ole Rimpaine and Karinte Ole Manka don’t decide to requisition them, grab a couple of spears, and head out to raid cattle and take some land back from the British. Photo gallery (51 images): click here.